Cyrus McCormick was a passionate advertiser. "Trying to do business without advertising is like winking at a pretty girl through a pair of green goggles," he said. "You may know what you are doing, but no one else does." A Virginia farmer invented a mechanical reaper, then harvested profits in the Midwest's exploding grain belt, innovating credit, service, and sales practices that became essential parts of American big business. 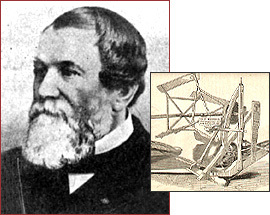 In 1831, twenty-two-year-old Cyrus McCormick took over his father's project of designing a mechanical reaper. Working on his family's Virginia farm, McCormick implemented features of the machine that remain in use today: a divider, a reel, a straight reciprocating knife, a finger, a platform to catch the cut stalks, a main wheel and gearing, and a draft traction on the front. In 1834, in the face of competition from other inventors, McCormick took out a patent and soon after, began manufacturing the reaper himself. The mechanical reaper was an important step in the mechanization of agriculture during the nineteenth century. Before the reaper, the amount of grain that could be cut by hand during the short harvest season limited both food supply and farm sizes. McCormick's reaper would win international acclaim at the first world's fair in London's Crystal Palace, in 1851. It would also free farm laborers to work in factories in the expanding industrial revolution. In the late 1840s, McCormick made a fateful business decision, moving to the young town of Chicago in America's western frontier and gambling that America's agricultural future was in the nation's prairie states: Illinois, Indiana, Ohio, Wisconsin, and the territories that would become Nebraska, Kansas, and Minnesota. His venture would repay him with a fortune. McCormick single-mindedly devoted himself to work. In 1848 his factory made 500 reapers; in 1851 it produced a thousand; by 1857 it was turning out 23,000. Continuously introducing improvements, McCormick launched new models every year, as car dealers do today. He bought other agricultural patents and companies, expanding his empire to sell mowers, harvesters, and more. He offered money-back guarantees and credit to struggling farmers, saying, "It is better that I should wait for the money than that you should wait for the machine that you need." He established an extensive service organization, staffed with local agents who could befriend farmers, show them how to use the machines, and assess their credit-worthiness. McCormick died in 1884, hard-driving to the end; his final words were, "Work, work, work." His company would combine with others to become the International Harvester Company two decades after his death.